I have a sordid secret. My nails are terrible. They're weak, flakey and according to my mum I've been gnawing away at them since I grew teeth. I've successfully grown them to an acceptable length only twice this year but after watching too many elimination episodes of Masterchef Australia lately (it's tense), I've successfully annihilated them yet again. 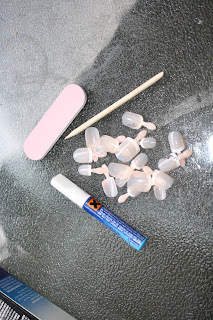 Here's wear false nails come to the rescue. I wish I could rock really funky, longer talons but the sheer length of them frustrates me enough to rip them off in an undignified manner on public transport. Ouch. So, to spare my fellow commuters and allow myself to undertake normal daily tasks, I opt for the shortest falsies I can find. 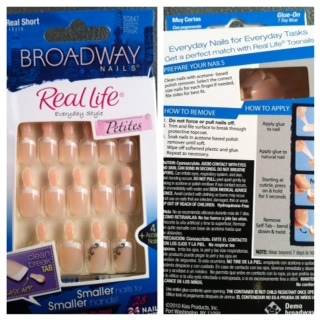 My latest discovery in this category is the Real Life Everyday Style Petites in Real Short length by Broadway Nails. A mouthful? Yes. A hassle? No! This little packet contains 28 nails in 12 sizes, especially designed for little hands. Whilst by no means elegant, my hands and feet are pretty tiny and I don't like having to file down false down nails to make them a better fit for my childish nail beds, so these are perfect for me. Each nail is fitted with a 'clean break tab' that supposedly makes application a little easier. I don't really think the tabs made a huge difference but they do snap off really cleanly so there's no need to file afterwards. The pack comes with a little tube of pink nail glue, which isn't the best I've tried but the quality of the nails makes up for this little indiscretion. The nails I tried are in the style of a classic squared oval french manicure, with 4 accent nails featuring a sort of silver and black swirly pattern. These falsies really couldn't be easier to use and I had a full set applied in ten minutes flat which is a pretty mean feat for a clumsy monkey like myself. 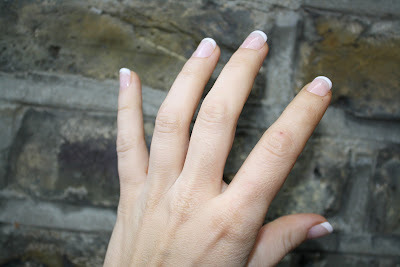 Broadway nails are definite winners in my book and if you're on the hunt for an instant manicure to complement sunkissed skin, I strongly suggest you give these a whirl. Retailing at £7.95, these are a little pricey but sometimes beauty is (financial) pain right? I got these at Boots. Have you tried Broadway Nails? Do you have any suggestions for a similar product at a littler price? Pricey but they look worth it! My nails have been so strong ALL my life but they're breaking so often now it's annoying. They look so good! I am hesitant to use products like these but yours look so great!